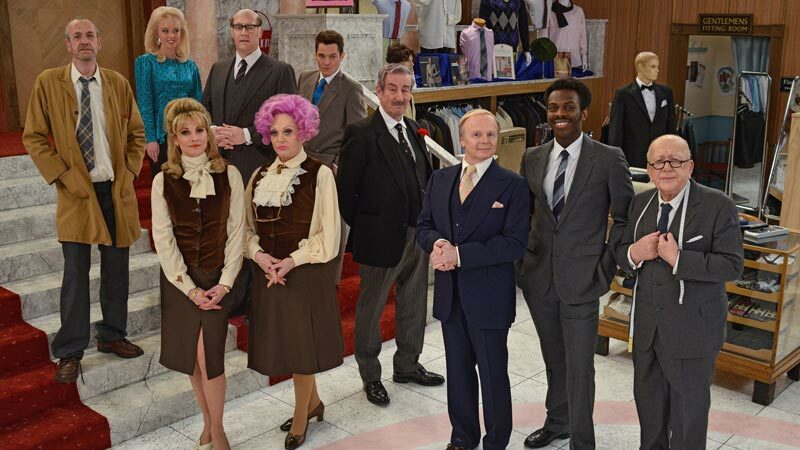 Studio audiences at dock10 enjoyed a comic treat as the BBC revived its classic Are You Being Served as part of its landmark comedy season to celebrate the 60th anniversary of the television sitcom. Filming took place for one week at dock10’s HQ1 and saw an all new cast of television veterans step into roles that have become household names. Like the original show which ran from 1972-1985, the one-off follows the misadventures of the staff at a fictional London department store called Grace Brothers. Young Mr Grace is determined to drag Grace Brothers into 1988 although Mr Humphries, Captain Peacock, Mr Rumbold and Mrs Slocombe all seem to be stuck in another era. The new cast included BAFTA award-winning Jason Watkins (The Lost Honour Of Christopher Jefferies) who played the role of Mr Humphries; Sherrie Hewson (Benidorm, Coronation Street) played Mrs Slocombe; John Challis (Only Fools And Horses) played Captain Peacock; Roy Barraclough (Coronation Street) was Mr Grainger; Arthur Smith (comedian and writer) played Mr Harmon; Justin Edwards (The Thick Of It) played Mr Rumbold and Niky Wardley (The Catherine Tate Show) was Miss Brahms.